Simple yet creative solution to Merge Room Divider with removable Shelves. Aarsun Woods continue to provide robust solutions for ones looking to efficiently use their existing space without extending their homes. Wooden Room Dividers already are a great replacement for Brick Walls as they can be folded and moved from one place to another. Now we bring to you a Combination of Room Divider and Portable Wall Shelves that can be placed almost anywhere befitting your need. Move the Partition with Shelves around as per your requirement. The design is planar thereby making it perfect for Modern Homes as well. When not in use or at the time of shifting, just remove the planks and fold the room divider. Perfect for bookworms trying to find a quite private space for themselves along-with their books. 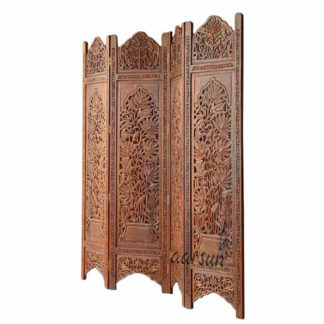 The unit consist of 4 panels and each panel comes in standard size of 20″width in front and 72″height approx.The wooden partition gives very traditional and elegant look to your home.The wooden partition can be placed in zig zag position or as shown on the product picture and can be fold easily and you can easily move it from one place to another. Wooden Room Dividers can be used as Privacy Screens or can also be placed in Pooja Room for dividing the space elegantly. We are the manufacturers of Wooden Partition / Room Divider and the unit can be customized as per your requirement. Have an ethnic and stylish look to your living space or work-space with our Handcrafted Wooden Room Divider Partitions artistically feature timeless designs. Each Room Divider is made by attaching 3 / 4 / 6 panels that can be extended or used as a single panel for decoration purposes. Each Panel is 72 inches (6 feet approx.) high and 20 inches in front width. The Partition Screen / Room Divider can be folded and moved from one room to another without any worries. The Room Divider is to be placed in zig-zag position and free-floor standing. Each Room Divider has its own shade and texture due to the fact that each wooden piece has its own shade. This quality alone sets each unit apart from their counterparts in terms of shade and texture. Also, with time, the units are naturally fine finish giving it an antique appearance. Totally solved our purpose…very happy with the manufacturer. .. Aarsun woods did a wonderful job….although it arrived late but totally worth the wait.